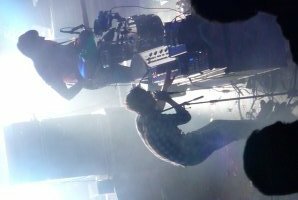 "This'll be our last gig for a long time," reckons Friendly Fires front man Ed Macfarlane, before the band bursts into Lovesick in front of a lively, beered-up crowd at The Coronet. We hope he's just being dramatic, because tonight's gig proves that live, Friendly Fires are even better than their intelligent, original, pop-carnival-dance album suggests. And we're looking forward to seeing more of them. Soon.Although their reception is magnified by the audience's boozing and the lateness of the hour (it's 1.40am), the acclaim is totally deserved.And we're glad they make such an impression, because the Elephant and Castle venue certainly doesn't. With a 40 minute queue in the cold for the cloakroom, cans of Fosters at £4 a pop and no water supply to the toilets, the organisation leaves something to be desired.But back to the band. With masses of depth, layer upon layer of sound and some killer beats, Friendly Fires could almost be from Sao Paulo instead of St Albans. Crowd-pleasing is the order of the night, so favourites Jump In The Pool and In The Hospital show up early on.There's plenty of rhythm to go around. Macfarlane's moves include hip jiggles, robot arms and a sort of upper-body shake which looks far cooler than it sounds. The man can dance.He can sing too - bathed in coloured light and segueing beautifully from track to track, his vocals surf through the gig, propelled by waves of full-on sound, samba drums and killer guitar.Friendly Fires close out the evening with Paris, a drunken singalong and a satisfying spray of dense confetti. You wouldn't have thought it'd be easy to bring a carnival atmosphere to London in December, but somehow they've pulled it off.